The family of Mr. Carter join Palmdale Water District President Gordon Dexter (2005 to 2007 and 2009 to present), General Manager Dennis LaMoreaux, and former Directors Al Beasley (1964 to 1972) and Hal Macy (1972 to 1989) as the Leslie O. Carter Water Treatment Plant is dedicated in Mr. Carter’s honor. Palmdale Water District President Gordon Dexter (2005 to 2007 and 2009 to 2013), Secretary Raul Figueroa (2003 to 2011), Treasurer Linda Godin (2006 to 2011), General Manager Dennis LaMoreaux, and former Directors Al Beasley (1964 to 1972) and Hal Macy (1972 to 1989) address the family of long-time Board President Leslie O. Carter during the 2010 dedication ceremony of the Leslie O. Carter Water Treatment Plant. Improvements to the Leslie O. Carter Water Treatment Plant will ensure high quality water continues to be delivered to the customers of the Palmdale Water District. Norm Hickling, area representative for Los Angeles County Fifth District Supervisor Michael D. Antonovich, joins the Palmdale Water District, Los Angeles County Waterworks, and Quartz Hill Water District in a workshop held May, 2011 at Home Depot in Lancaster. The workshop taught customers how to fix leaks in their irrigation systems. July 24, 2013: A.V. Water Briefing at Palmdale Water District (PWD) Leslie O. Carter Water Treatment Plant (LOCWTP) – control room at LOCWTP. L to R – The Honorable State Senator Steve Knight; Peter Thompson II, Operations Manager, PWD. Mrs. Mary Carter and Palmdale Water District General Manager Dennis LaMoreaux accept a Certificate of Recognition from State Senator George Runner’s office at the dedication ceremonies of the Leslie O. Carter Water Treatment Plant. Palmdale Water District Director Gloria Dizmang (2011 to present) and Aquadog ready to help the District’s Plant Sale customers at the 2012 Plant Sale. Palmdale Water District Director and chair of the District’s Outreach Committee Gloria Dizmang (2011 – present) draws the winner, Charles Redman, of the 2013 “Before The First Drop” Landscape Makeover Contest at the August 29, 2013 Board meeting while Palmdale Water District Director and member of the Outreach Committee Robert Alvarado (2011 – present) awaits the announcement of the winner. The family of Mr. Carter accepts a Commendation Certificate from Congressman Howard “Buck” McKeon’s office at the dedication ceremonies of the Leslie O. Carter Water Treatment Plant. Palmdale Water District Director Gloria Dizmang (2011 – present) with City of Palmdale Mayor Jim Ledford and Palmdale Water District Director-Elect Joe Estes at the September 14, 2013 International Heritage Festival. Palmdale Water District Board Directors Joe Estes (2013 – present), Kathy Mac Laren (2011 – present), Robert Avarado (2011 – present), Gloria Dizmang (2011 – present) riding with Aquadog and guests on the PWD float at the City of Palmdale Christmas Parade “Miracle on 47th Street” on December 14, 2013. July 24, 2013: A.V. Water Briefing at Palmdale Water District (PWD) Leslie O. Carter Water Treatment Plant (LOCWTP) – Touring lab at LOCWTP. L to R – The Honorable State Senator Steve Knight; Audel Narez, Lab Analyst, PWD; Peter Thompson II, Operations Manager, PWD; Kathy Mac Laren, Director (2011 to present), PWD; Andy Rutledge, Director, Antelope Valley East Kern Water Agency. Palmdale Water District employees provide District information at the September 14, 2013 International Heritage Festival. The men of Green Bee Nursery and A.V. Garden nd Turf enjoying the District’s First Annual Plant Sale in 2012. July 24, 2013: A.V. Water Briefing at Palmdale Water District (PWD) Leslie O. Carter Water Treatment Plant (LOCWTP) – outside microbiology lab during LOCWTP tour. L to R – Andy Rutledge, Director, Antelope Valley East Kern Water Agency; The Honorable State Senator Steve Knight; Peter Thompson II, Operations Manager, PWD; Kathy Mac Laren, Director (2011 to present), PWD. Palmdale Water District Directors Gordon Dexter (2005 to 2007 and 2009 to 2013), Robert Alvarado (2011 to present), Gloria Dizmang (2011 to present), Kathy Mac Laren (2011 to present), and Aquadog waiving to the crowd at the 2012 Palmdale Holiday Parade. Palmdale Water District Director Robert Alvarado (2011 – present) manning the District’s booth at the September 14, 2013 International Heritage Festival. Melody McDonald, JPIA Executive Committee Member for the Association of California Water Agencies Joint Powers Insurance Authority (ACWA/JPIA), presents Palmdale Water District Directors Jeff Storm (2004 to 2005 and 2007 to 2011), Raul Figueroa (2003 to 2011), Linda Godin (2006 to 2011), and Gordon Dexter (2005 to 2007 and 2009 to 2013) with a refund check from the JPIA in the amount of $105,000 for the District’s participation in their Rate Stabilization Fund. This Fund provides refunds when members’ claims losses are less than those projected by the JPIA actuary. The District is one of a number of agencies participating in ACWA/JPIA to help pool resources and reduce insurance rates. The Palmdale Water District takes advantage of JPIA’s training opportunities in the areas of employee safety, employment practices, infrastructure management, and risk transfer to help further reduce insurance rates. Palmdale Water District Director Jeff Storm (2004 to 2005 and 2007 to 2011), Treasurer Linda Godin (2006 to 2011), and Vice President Steve Cordova (2009 to 2013) present Elsie Gabo and Stacia Nemeth with Cash for Grass Rebate certificates and checks at the May 25, 2011 Board meeting. Elsie and Lorenzo Gabo received a rebate check for $530.00, and John and Stacia Nemeth received a rebate check for $513.60. Not pictured are Larry and Mattie Thompson who received a rebate check for $756.40. Vice President Cordova stated that “Conserving water is top priority for those of us at the Palmdale Water District. We are proud that so many of our customers are joining us in this vital activity. To date, 112 customers have signed up for the Cash for Grass program.” “Several schools, as well as the City of Palmdale, are participating in the District’s Cash for Grass rebate program. The District appreciates these recent conservation efforts. 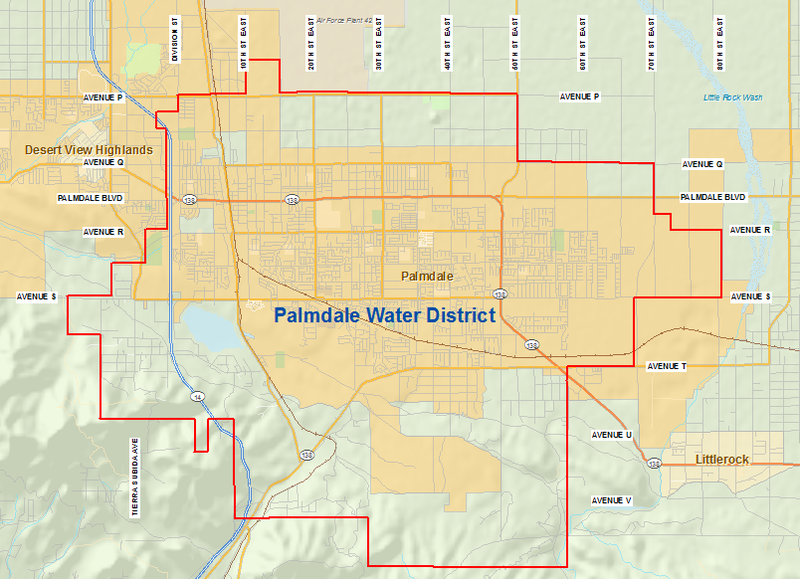 The Palmdale Water District has concentrated on water conservation efforts for the past 20 years,” said Palmdale Water District Water Conservation Supervisor Claudette Roberts. A.V. Garden & Turf busy selling some great High Desert plants at the Palmdale Water District’s 2012 Plant Sale. Another great shot with A.V. Garden and Turf and their beautiful plant selection at the Palmdale Water District’s 2012 Plant Sale. Aquadog saying hello to former Palmdale Water District Director Dave Gomez (2005 to 2009) at the District’s First Annual Plant Sale in 2012. July 24, 2013: A.V. Water Briefing at Palmdale Water District (PWD) Leslie O. Carter Water Treatment Plant – near wind turbine at Palmdale Lake during tour of LOCWTP. The Honorable State Senator Steve Knight and tour participants. Aquadog and Palmdale Water District Directors Kathy MacLaren (2011 to present) and Gloria Dizmang (2011 to present) are excited about the 2012 plant sale! Aquadog with Palmdale Water District Directors Gloria Dizmang (2011 to present), Kathy Mac Laren (2011 to present), Gordon Dexter (2005 to 2007 and 2009 to present), and Robert Alvarado (2011 to present) at the 2012 Palmdale Holiday Parade. Palmdale Water District Directors Gordon Dexter (2005 – 2007 and 2009 – 2013), Kathy Mac Laren (2011 – present), Steve Cordova (2009 – 2013), Robert Alvarado (2011 – present) and Gloria Dizmang(2011 – present) draw the finalists for the 2013 “Before The First Drop” Landscape Makeover Contest at the August 29, 2013 Board meeting. Aquadog riding on the Palmdale Water District float at the City of Palmdale Christmas Parade “Miracle on 47th Street” on December 14, 2013. July 24, 2013: A.V. Water Briefing at Palmdale Water District (PWD) Leslie O. Carter Water Treatment Plant – Reviewing maps and discussing local water issues. L to R – Dennis LaMoreaux, General Manager PWD; Steve Perez, General Manager, Rosamond Community Services District; Peter Thompson II, Operations Manager, PWD; Andy Rutledge, Director, Antelope Valley East Kern Water Agency; Neil Weisenberger, Director, Antelope Valley East Kern Water Agency; Gloria Dizmang, Director (2011 to present), PWD; Kathy Mac Laren, Director (2011 to present), PWD; The Honorable State Senator Steve Knight. Palmdale Water District Treasurer Linda Godin (2006 to 2011) and General Manager Dennis LaMoreaux provided a presentation to the Palmdale Kiwanis West Club on the District’s efforts to provide better service and more district transparency. This presentation is part of a series of meetings to ensure the greatest level of cooperation possible between the Palmdale Water District and local community organizations.